The Carl B. Kern Fund is honored to include Harold H. Prugh among its list of donors. The following profile details his tremendous dedication to the YMCA which continues today. Born March 15, 1908, Harold H. Prugh grew up in Dayton, Ohio and attended Camp Kern as a camper from 1918 through 1922. He was among the infamous group of campers who took a 36-mile hike to Cincinnati, stayed at the Central Parkway Y overnight, and hiked back the next day, when Paul H. 'Pop' McKee was camp director. In 1926, Mr. Prugh graduated from Steele High School and went back to Camp Kern as a Cabin Leader that summer. 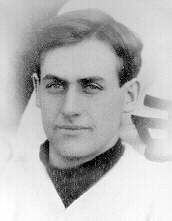 He returned the following three summers - through 1929 - as a Cabin Leader and Athletic Director. He graduated from Heidelberg College in 1930 and received an M.A. from Columbia in 1932. He then returned to Camp Kern that summer one last year to serve as the Assistant Camp Director under Ralph D. Roehm. And there he met his wife-to-be Janice who was coming to see her 2 brothers as campers on a Visitors' Sunday(!). They were married November 30, 1935. Mr. Prugh became the Associate Physical Director at the Downtown Pittsburgh Y from 1935-40 and Physical Director at the nearby McKeesport Y from 1940-42. From there he went to the Williamsport Y (1942-44) before going to the Omaha Y (1944-50) and on to Columbus in 1950. Mr. Prugh started working at the Glendale Family Y in 1954 where he 'officially' retired over 20 years ago but still remains active today at age 87, teaching Tennis and Badminton. On April 26, 1995, Mr. Prugh was a volleyball referee for the last time. He started to referee in January, 1931 at the Dayton YMCA when Harold T. Friermond set up an 8-team Inter-Y Volleyball Tourney on a Saturday. Mr. Friermond asked Mr. Prugh to ref the first match when the Ft. Wayne Y faced the Pittsburgh Y. In recent years, Mr. Prugh has officiated about 50 high school matches a year. According to him, his biggest thrill was to referee at 29 National Tourneys in a row (1952-80) and to ref the first Olympic Volleyball Tryout Tourney in New York in 1964. There is an interview with Mr. Prugh concerning volleyball in the U.S. Volleyball Archives in Mt. Holyoke. Although it has been over 60 years since Harold Prugh lived in Dayton and was affiliated with the Dayton YMCA, he still has many memories of Camp Kern, and has generously supported the efforts of The Carl B. Kern Fund and other special projects, including the Ralph D. Roehm Memorial Cabin. About Ralph Roehm he wrote in 1992, 'I never knew a more dedicated YMCA Director in my 42 years full-time in YMCA work. He was a real Staff Leader and always had a positive view as to the needs of others. He encouraged all persons to give their best to life.' If Ralph Roehm expected the highest standards and dedication from his staff, Harold Prugh has certainly succeeded in fulfilling those expectations, and then some.